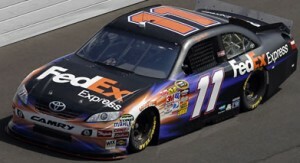 Denny Hamlin finished ninth in Saturday night’s NASCAR Sprint Cup Series race at Charlotte Motor Speedway, Round 5 of the 2011 Chase for the championship won by Matt Kenseth. Hamlin restarted fifth after the final caution with 12 laps remaining, but a tight race car prevented the 30-year-old driver from challenging for the win, as he collected his 11th top-10 of the season. The #11 FedEx Express Toyota started 17th in the 334-lap event around the 1.5-mile speedway. Hamlin and crew chief Mike Ford worked through a tight condition on the race car during most of the race, but timely cautions, helpful adjustments and quick work by the FedEx crew on pit road put Hamlin inside the top-five with less than 100 laps to go. Hamlin ran among the top-five as the laps clicked, with his car working better on the short runs. A flurry of late-race cautions moved the #11 Toyota into the top-three, but the tight condition returned and track position shuffled Hamlin back in the final running order. The finish keeps Hamlin 12th in the Chase standings following Charlotte, 86 points behind leader Carl Edwards. The second half of the 2011 Chase kicks off Sunday at Talladega (Ala.) Superspeedway. Hamlin has three top-five finishes and four top-10 results in 11 previous starts at the 2.66-mile high-banked oval, including a career-best third place run in the spring 2008 event. The #11 FedEx car has consistently been one of the fastest at Talladega in recent years, with Hamlin leading at least one lap in his first 10 starts at the track, and has led 10 or more laps in six events. Hamlin finished ninth in the Chase race at Talladega one year ago after starting 17th and leading four laps. Hamlin has the fourth-best average running position (15.1) at NASCAR’s longest track over the last six years, trailing only teammate Joey Logano, Dale Earnhardt Jr. and Juan Pablo Montoya. In the spring race at Talladega this past April, Hamlin qualified 29th and spent the majority of the 188-lap event biding his time until the end. Working the tandem draft with Ryan Newman, Hamlin’s strategy was to avoid trouble early in the race to make a late push for the win. A late tire issue for Newman caused Hamlin to search for a new partner, finding one in Logano. The duo ran among the top-10 until three laps to go, when a spin in front of them caused the two cars to separate and Hamlin to lose the lead draft. The FedEx Office located in Highland Village, Texas, currently leads the company’s President’s Club program, and will be recognized with its “2198″ store numbers on the b-post of the #11 FedEx Office Toyota this weekend.